1 x Golf Swing Trainer. Designed to create the correct swing positions by setting the correct hinge position at the top of your back swing. Simple yet effective golf training tool. Can be used whilst hitting balls at practice. Perfect for both indoors and outdoors, you can hone your swing anywhere you want. Our working schedule: (not include weekend sorry for delayed replay at weekend). Golf Sports. This Golf Driving Net is a fantastic training aid for all golfers. Suitable for indoor and outdoor. Easy to carry and storage, easy to clean. Length Width Thickness: 60 30 1cm. Color: As picture. Number: MD0167. Voice Caddie SC200 Swing Caddie 2 Portable Launch Monitor - Blue. Condition is Used. Shipped with USPS Priority Mail. Comes with Remote. 1 x Golf Putter Laser Pointer. Easily attaches to most putter shafts. Perfect for anyone wishing to get more accuracy and proficiency on the putting green. Projects laser point for aim reference to hole. IMPACT SNAP Golf Swing Trainer and Practice Training Aid. Condition is New. Shipped with USPS Priority Mail. Golf Sense Revolutionary Motion r Swing Analyzer & Logix Range Finder w/clip . Condition is New. Shipped with USPS Priority Mail Padded Flat Rate Envelope. By using the Lag Stick you will finally discover what it takes to be a great ball striker! 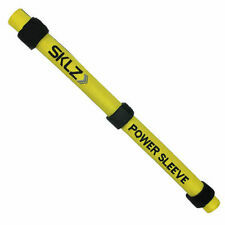 Use the training stick in any one of your golf clubs. 1 Golf training stick. 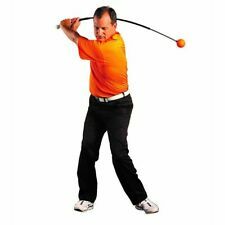 Learn to hit the ball straighter and further with it. This is a wide angle mirror, shows a full view of your swing and stroke. For full swings place it in front of you or behind you for instant views of your swing positions. For putting, place it in front of you or between your feet. Adopt strong magnet, ca n stay attached to club firmly, no need to worry falling. 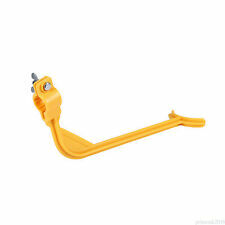 1 Golf Magnetic Lie Angle Tool. Indicates when the face is square, open or closed. Shows where the face is pointing on a side-hill lie, and how a player should adjust stance to hit the ball where intended. This plastic golf putting cup can turn any room, office, garage, yard into your personal putting green. Made of plastic. Allows you to practice your putting virtually anywhere. 1 x Golf Putting Cup. Analyze your Swing. Flash Storage up to 2000 Swings. Excellent Condition. 3-Axis Gyroscope. When you hit this peg with your ball, it makes the sound of plunking one in the cup. See photos for details. Perfect for both indoors and outdoors, you can hone your swing anywhere you want. This Golf Driving Net is a fantastic training aid for all golfers. Great training aid. Portable golf training net. 1x Golf Training Net. Asahi golf. exact square impact By draw a straight line to the ball is a sphere it is difficult to square impact in batting, impact ball liner Shapipen with / specification Material can be square impact to match the straight line and a straight line: Plastic Size: φ50 x 40mm weight: 4g with original felt-tip pen /. GOLF SCREEN SUPERTEX POLY 9 OZ. Both golf impact screens can take a real golf ball and carry a 6 month LIMITED warranty. 80% of residential golf screens are supertex. The downside of the poly golf screen material is it has a ?. Selling an Optishot Golf Simulator package with everything needed to get started! This includes:*Opti Shot simulator with software. The Portable Cage is 10'x10'x10', and can be used inside or outside. CamCaddy(Cradlz) is by far one of the simplest golf inventions that doesn't teach you how to swing or attempt to correct what you are doing. It just simply shows you what you are doing. For years players of all levels have not had a "What am I doing?". Orange Peel By Orange Whip! Both of these injuries were a direct result of using a very poor quality and easily available mat for practicing during our snowy winter months. Within one week my wrist was well and my elbow was almost non-existent and improving daily. There are many things you can do to step up your golf skills outside of playing on the course. Golf accessory companies have created a wide variety of golf training aids that can help improve different areas of your golf game. The great thing about these training aids is that they can be used in an outdoor area, as well as in the comfort of your home or office. What types of golf training aids are available? There are many different types of golf training aids that are available. If you're looking to build your chip shot to help you get out of bunkers, you can use a chipping net to help practice your accuracy. If you're looking to take your golf putting skills to the next level, a putting training aid can help you improve your stroke and accuracy. Two of the common go-to training aids are the indoor practice range and golf mat. An indoor practice range helps you improve your swing. You can use this practical tool to work on your power and form. It comes with a net to catch the golf ball without any problems. 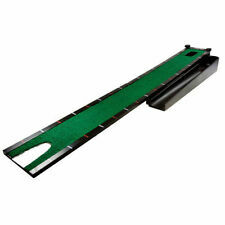 The golf mat simulates the feeling and texture of real grass for accurate putting. These mats come in different grass textures, surface shapes, and lengths to hone your putt. How do golf training aids work? Golf training aids are designed to simulate various aspects of the game that you'll encounter on the golf course. 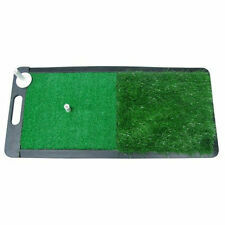 Some putting aids come with different textures of grass to prepare your putt shot for different courses and situations. They may also have surfaces that rise up and down to simulate the actual surfaces you'll be putting on. These putting aids are built to train your ability to read the green, control your power, and hone your putting accuracy. The whole idea behind these tools is based on improving different parts of your game, whether it's your swing driver, approach shot, putting, or chip shot. These tools can be trained with for as little as 30 minutes a day. With consistent practice, you will find that your game has been significantly upgraded over the course of several weeks to months. Which training aids help with your fitness, strength, and form? 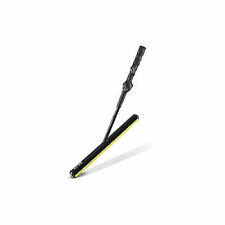 Grip strengthening tools are used to strengthen and condition your hands, wrists, and fingers. You'll find unique tools like weighted shoulder vests to help golfers make bigger shoulder turns for a more explosive swing. There are also tools that help with your swing indirectly. A good tool that can help your form is a wrist attachment. It flattens your wrist to support your follow through, maintain consistency, and help you become habituated to proper swing form. Weighted gloves can be used to get the hand and forehand accustomed to resistance and increase swing speed over several months of use.